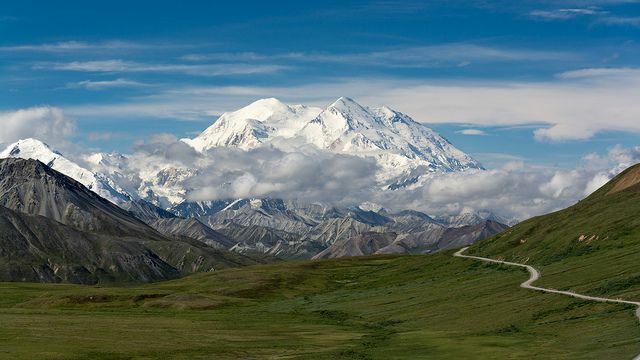 If you’re in Denali, Alaska, you probably already know by now that Denali is the highest mountain peak in the United States, with a summit elevation of over 20,000 feet. What you may not know is that there are tons of activities to keep you busy in Denali, even if you’re not attempting to summit the mountain. Here are a few of our favorite tours, restaurants, and walks so make up the itinerary that works best for you. Note that the tours and walks are highly seasonal. Be sure to confirm that they’re running when you’re in town. A 3-mile round trip walk with minimal elevation gain, the Horseshoe Lake trail is great for a panoramic view of Nenana Lake. If you speed through, you can do it in an hour or less. Because it’s so accessible, though, know that you will definitely be sharing the path with other hikers. You can pick up the trail outside the Denali Visitor Center. For a more intense hiking adventure, check out the Savage River Loop. It’s about 4 miles, round-trip, so plan to take about two hours because of the terrain. The Loop follows a riverbed across the Alaska tundra, and you can expect to see a wide range of flowers and wildlife. Think Dall sheep, marmots, and caribou. You can take the free shuttle bus to the trailhead at Savage River check station. The Denali Natural History Tour departs in the morning and in the afternoon, so you can still catch a tour if you’re arriving by train from Fairbanks. This 5-hour expedition costs $99.00 and gives you an in-depth understanding of the history of Denali National Park. The highlight is a visit to Savage Cabin, which has served as a camp cook’s house, a tourist camp, and is currently the National Park Service’s patrol cabin. A guide explains the changes that have shaped the role of the building since its construction in 1924, tracing the history of the Park and the mountain along the way. You’ll also get the opportunity to hear from an Athabascan Alaskan Native about the experiences of their tribe on the land they’ve inhabited for thousands of years. The Tundra Wilderness Tour is an 8-hour expedition on a coach-style bus through the Toklat River area inside Denali National Park. An experienced naturalist accompanies you to provide a history of the park and explanations of the flora and fauna you pass along the route. There are morning and afternoon departures every day from the hotel, but confirm with us just to be on the safe side. The $165.50 price of the tour includes lunch and drinks. In the winter, this tour is 4 or 5 hours while parts of the unthawed road remain inaccessible. We’re going to let you in on a little secret. There are free shuttle buses that follow similar routes to the paid tour bus. The Savage River Shuttle does a 2-hour loop through Denali National Park, departing from Denali Visitor Center Bus Stop and the Wilderness Access Center. You’ll miss the commentary from professional naturalists, but odds are decent that your shuttle driver is a wealth of information about the area’s history and wildlife. You can also jump out at various stops along the way for a picnic or a walk on one of the many trails. New to the Denali Canyon, Karsten’s Public House is located at McKinley Chalet Resort’s premier Base Camp. Featuring an exhibition kitchen and an urban, yet authentic Alaska feel, Karsten’s is the best place in the Denali area to grab a craft brew and some delicious bites. Enjoy fare like cumin and chili crusted spare ribs, a caribou burger or King crab fettuccine – Your tastebuds will thank you! This small, unpretentious place cranks out beloved classics made from scratch for breakfast, lunch, and dinner. The staff is friendly, the salmon and halibut are as fresh as you can get, and don’t leave without having a piece of rhubarb pie. Denali boasts over six million acres of natural landscapes. All of the land, with only one road leading in and out. While you won’t be able to see it all in 12-hours, hopefully this will get you heading in the right direction. And if you find you need more time, you can always extend your stay.